In an era where games have been pursuing the goal of a fun way to make kill and loot a versatile game mechanic, it was sure there was going to be at least one title to emerge from all the rubble. 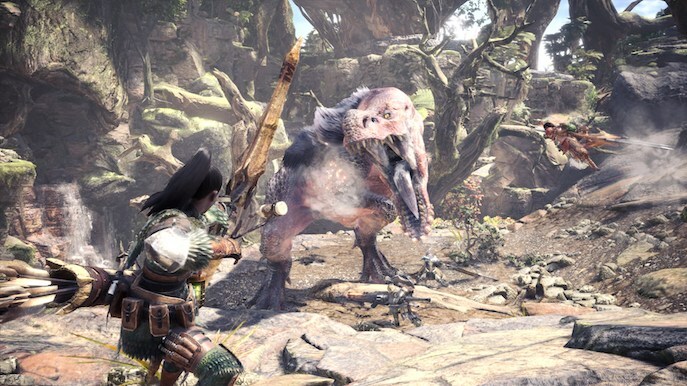 Monster Hunter: World, the action RPG developed and published by Capcom, has proven that this simple yet interesting and addicting system can be a success, with over 40 million units sold worldwide across PS4 and XBOX One (and soon to release on PC in fall of 2018). However, this is the latest installment of the franchise and yet it has become the greatest Capcom title ever sold, why didn’t the other Monster Hunter games get this type of achievements? Why is MHW such a huge phenomenon? Let’s check it out! SO DO YOU BASICALLY DO WHAT THE TITLE SAYS? 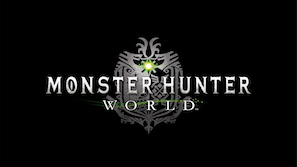 Let’s not get too literal, but generally speaking, yes; In Monster Hunter: World (MHW for abbreviation purposes), you take the role of a hunter who is part of the Fifth Fleet to reach the New World which is a mysterious island filled with extravagant ecosystems that was never truly discovered due to scientific and technological limitations, but that is now a problem of the past if it wasn’t obvious already. This New World is also filled with interesting fauna, small and large monsters roam these lands and skies living their normal -AI programmed- lives. The point of the game is to discover why Elder Dragons (a much more legendary type of monster) are migrating to this place, specifically Zorah Magdaros, a giant volcano type dragon. As you venture through to find out this reason, you will be assigned to hunt monsters, loot their materials, craft gear and weapons and eventually “beat” the game. CAN YOU HUNT IN GROUPS THOUGH? Absolutely. 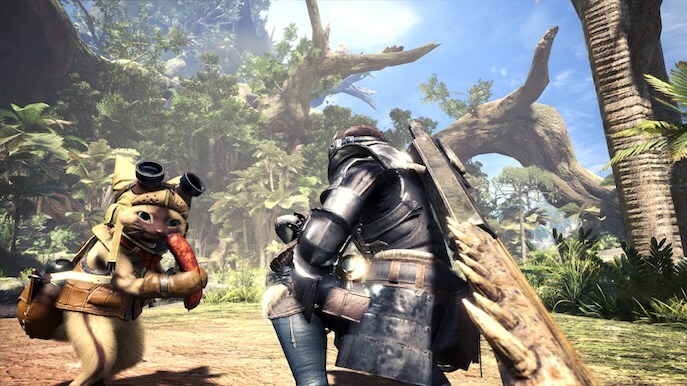 For the first time ever in the Monster Hunter series, players can enjoy a drop-in multiplayer system that is cross-region cooperative between Japan and the West. Quests can be played solo or up to 4 players (depending on the quest restrictions, but most of them are squad compatible). The whole idea of the game is to fulfill a specific objective from the quest, either be it Slay or Capture a monster be it small, large or an Elder Dragon, or do simple tasks such as exploration, collecting resources or looting specific items from the world. The thrill of the hunt lays upon doing with friends or even just strangers, mostly because of how the game offers enough tools to make this synergy work. 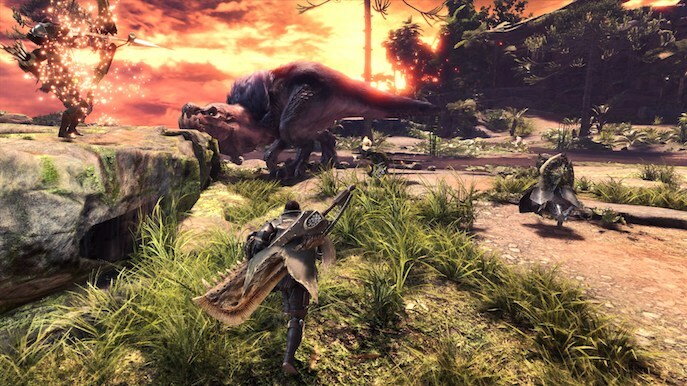 The learning curve for MHW is quite a big one, especially for most of its new player base who are experiencing the franchise for the first time. Luckily, it becomes intuitive and all the menus and micro-managing go from being overwhelming to fairly automatic. 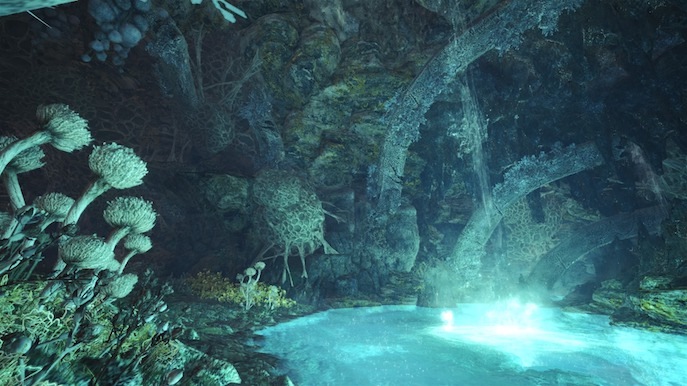 The game’s main Hub is called the Astera. This giant base of operations allows you to prepare for every hunt in pretty much every way. Let’s start with the basics: Hunting a monster and succeeding in the quest will give you rewards such as the monster’s materials and other miscellaneous. These materials can be used to craft gear and weapons suitable to your playstyle. 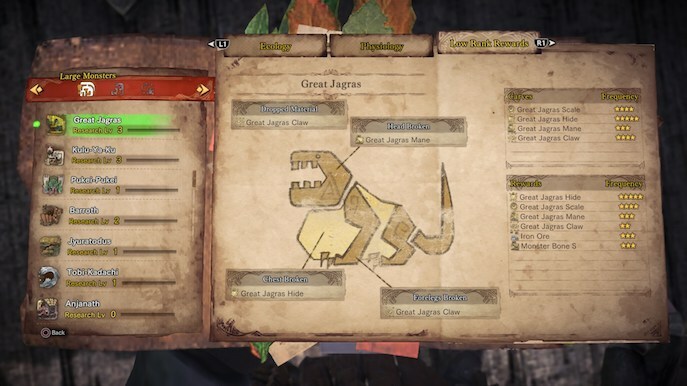 The game offers an armor set (headgear, chest, greaves, braces, and coils) for each monster in the game, offering unique stats which can be mixed between sets to obtain the right combination of bonuses you desire. This goes as well for weapons; you can craft Great Swords, Sword and Shield, Hammer, Lance, Switch Axe, Insect Glaive, Heavy Bowgun, Long Sword, Dual Blades, Hunting Horn, Gunlance, Charge Blade, Light Bowgun and a Bow. All of these weapons have their own combo and attack animations, players can choose whichever they like and stick with it, upgrade it and master their combos for as much as they desire and later on switch to other weapons to keep the game appealing. You also have a Palico companion, a cat creature who will aid you in combat if playing solo or in duos. You can equip your Palico with gear and weapons too! As well as equip him with specialized Palico gadgets which grant you cool benefits during hunts. The amount of gear and weapons you can craft is pretty insane, and honestly you may have to read on builds for the best optimization if you’re looking for that. However, if you don’t particularly care about using materials and crafting and experimenting, be my guest. The joy of this game is to discover the limits of the builds and how effectively you can defeat monsters. You can go to your Room in the Astera and talk to an NPC to get inside the Training arena to practice move sets and use infinite number of items to test out your skills. Besides what you can equip to you and your Palico, you can also aid your hunting adventures with consumable items like healing potions, throwable ammo, pods, explosives, coatings, etc… The game features an Equipment Wheel for fast switching between all these items, making it easier during the heat of a fight. You can obtain these consumables during explorations or buy them at the Astera’s item vendor. The Astera also has a Resource Center, here you are offered Investigations which as quests with specific objectives you can fulfill to get random special rewards ranked by rarity in bronce, silver, gold or purple for more specialized items. You can also collect items during missions and help NPCs around the world asking you for said specific items, and later delivering these task to the Research Center. By doing so, you can do permanent upgrades to the Astera’s sections, improving your gameplay. Whatever sort of interactions you have by looting, discovering or simply completing quests, you will gain Research Points use as alternative currency to the main one which are Zenny coins (obtained simply by finishing quests). This station will also list weekly Limited Quests which offer very good rewards if completed. Next to the Resource Center, you have the Ecological Research which is basically a place where you can record your monster data. During hunts, you can find tracks of monsters and by collecting these you get intel on the monster allowing you to learn its weaknesses and their roaming patterns. For each monster you have a leveling bar for research, the more you collect data from them, the easier their tracking and quests will be, especially if you’re looking to get specific materials from said monsters. Next to this station you have the Botanical Research Center, here you can cultivate consumable items and then harvest them after quests (which is basically how the game moves in time). If you want to harvest more items and faster, you can use Fertilizers offered in this same menu. Before every mission is advisable to eat at the Canteen, here you can choose a platter and obtain health, attack and defense boosts which will only last until you finish the quest or get defeated, then you will have to wait a few minutes to be able to eat again. There is a Canteen in the Astera but you can also eat in every camp from each ecosystem. The Astera also has yet another NPC. The Melder basically allows you to meld items you don’t want or need that you have and create new ones you do need. For end game purposes, you can meld materials obtained from end game monsters to create materials for augmenting your gear and weapons even further. The top floor of the Astera has a Gathering Hub which basically works as a place to do Arena Quests. These quests simply make you do objectives related to slaying monsters in, you guessed it, an Arena. It goes into more depth but nevertheless it’s an interesting extra feature for shenanigans. Lastly there are Quest Boards will allow you to post Quests and later allow players to join you or you could join theirs, as well as do matchmaking to be ported to a server with players around your same skill set. Right next to these are the Item box which has all your belongings which you can sort and organize however you like. If you eventually have different builds you can save them via equipment or item loadouts. CAN WE HUNT NOW?! WHAT ARE YOUR THOUGHTS? Okay fine, even though this all seems to sound like a lot of stuff, the game offers enough tutorials to help you, and there’s always helpful forums and wikis that are trivial for this particular genre of games. 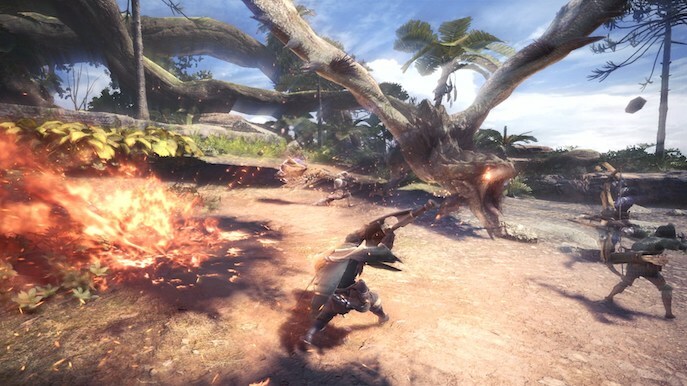 Once you set out to a quest the whole idea of hunting a monster revolves around learning their attack patterns, abilities and where they move across the map. Each monster has weak points which you can break and obtain their materials for said parts (if you gathered enough info thanks to the Ecological Research NPC). If a monster defeats you or your teammates many times, you will fail the quest. Chasing monsters across the maps zones is very engaging as you interact different depending the ecosystem, whether you swim or swing with vines, you enjoy all of this without loading screens. Seeing how there are so many armor sets and weapons, every squad you join for a quest feels like a unique adventure. Monsters have a bunch of health but once you all finally take it down or capture it after minutes of harsh encounters, the thrill of the hunt kicks in and you simply have to play more and more. Players have invested hours and hours in the game, some reaching over a hundred since the game came out. Some players either have enough of their build and simply try another build and play 30 more hours. Seeing the damage numbers on your attacks and how effective they are somehow gives a sense of satisfaction difficult to explain. One thing is for certain, Capcom has made a pretty interesting and addicting game with very few flaws. The whole system feels rewarding and even though there is RNG elements, the grinds are not as harsh as other games. The game is also beautifully designed in terms of its environments, monsters and items. Sure, that mix matching gear won’t look fashionably acceptable, but it shows that you in sometime during your play through you were able to slay a specific monster to earn the right to wear their gear. Monsters also have specific 3D models, and their variations use these same skeletons, however, they don’t look lazy which is a super good aspect in terms of creating appealing assets. And as for the soundtrack, it portrays the essence of an adventurous RPG where you kill monsters for a living, it is well balanced and mixed in a stereo atmosphere as well as greatly detailed foley, FXs and ambience. 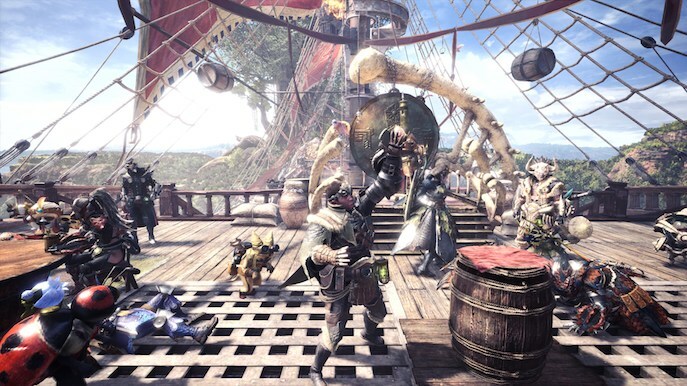 Monster Hunter: World is yet another open world game in a sea filled with similar genre titles, but it brings out many features the right way that many other titles struggled to accomplish. 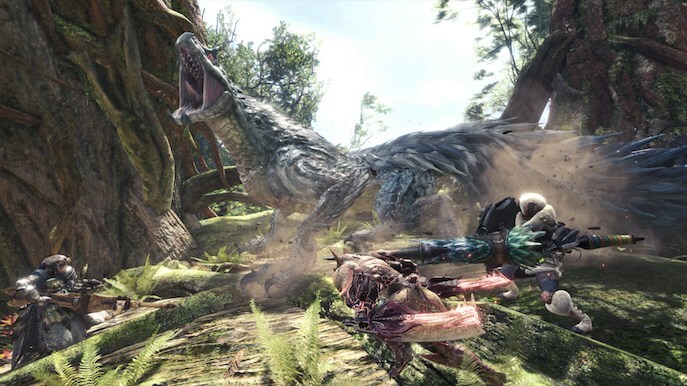 For a January release, MHW is already a GOTY contender.